* I like to use the rosemary garlic sea salt blend of seasoning for my veggies, It’s really reasonably priced and the company has an awesome line. I also enjoy the orange ginger and hope to buy more soon. Preheat oven to 350. Cut and trim brussels sprouts and cut broccoli into florets. Toss with olive oil (if you want, but this is recommended so your vegetables won’t dry roast), garlic salt or granules (or both), and lemon juice. Place on a foiled cookie sheet and bake for 20 minutes and 350 along with your red bell pepper. I placed it on a separate cookie sheet. While this is in the oven cook your “chicken” and chop your vegetables. 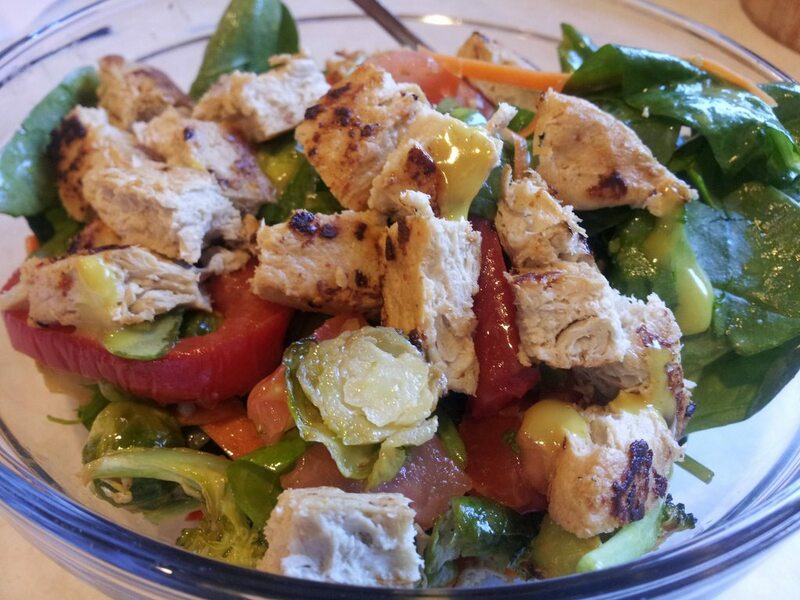 When your “chicken” is cooked, chop into cubes and mix with your roasted vegetables and all other ingredients. Serve immediately topped with your favorite dressing. I used an agave mustard dressing that was absolutely yummy. I’d recommend something creamy, but I’m sure anything would taste fine.